Use a Laptop More Comfortably! Lecube Laptop Pillow presents most comfy experience with a laptop to you everywhere in your home. Enjoy your laptop everywhere, on a bed, a sofa, a chair, a chesterfield, a settee and such. 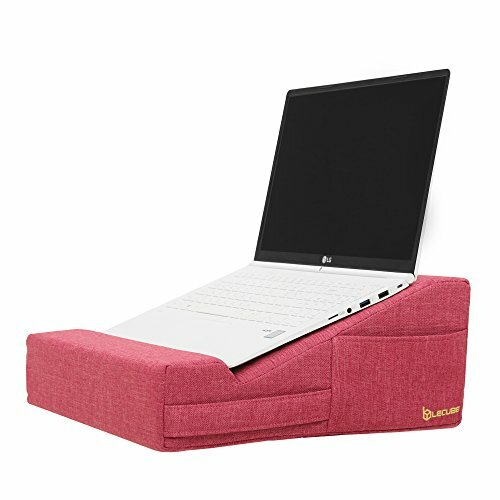 Enjoy your laptop in various pose like lying down, sitting down, leaning back on a bed and more. Lecube Laptop Pillow also keeps your position comfortable when you watch a movie, browse the internet and deal with simple tasks, etc. Light cushioned desk never give you a burden when you move it and when it's on your knee. Also this lapdesk would be perfect for both kids and adults. We are sure that Lecube Laptop Pillow would be the best choice for giving you the most comfort laptop user experience. ✔ Please check a size of the item before a purchase decision. If you have any questions about this product by LECUBE, contact us by completing and submitting the form below. If you are looking for a specif part number, please include it with your message.